The Scubapro K6 is a fully featured, fully sized dive knife that's ready to take on anything you throw at it. Featuring a 15.5cm stainless blade the K6 delivers confidence-inspiring cutting power while remaining convenient to handle and will remain corrosion free for years of use. The K6 features a fine hollow-ground cutting edge, a serrated sawing edge for cutting rope and a line cutter for hooking and cutting line. The handle has been designed ergonomically to maintain grip being usable even when wearing gloves. The base of the grip has been reinforced with stainless steel to function as a hammer. The Scubapro K6 is finished off with a tough plastic sheath protecting the blade when not in use while Scubapro's unique locking system ensures the blade only leaves the sheath when you want it too. The locking system is simple to use and is functional one-handed making the Scubapro K6 Knife an incredibly versatile and capable all round knife. Corrosion Resistant Blade - A high quality stainless steel blade ensures the K6 Knife will resist corrosion from underwater use for years to come. 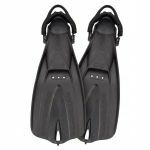 Big Cutting Power - The Scubapro K6's large 15.5cm blade offers substantial heft and cutting power while still retaining functional manoeuvrability. Line Cutter - The K6 features a line cutter notch to help you swiftly hook and cut through line, helping free you quickly and easily. Serrated Edge - The serrated edge allows you to saw through tough materials such as rope. Ergonomic Grip - Safely and comfortably control the K6 with it's ergonomically designed grip, even when wearing gloves. Stainless Steel Hammer – The K6 features a reinforced stainless steel grip pommel allowing you to use of the K6 as a hammer. Sturdy Moulded Sheath - The Scubapro K6 comes with a sturdy sheath ideal for protecting your knife and ensuring your don't cut yourself when not in use. Unique Locking System - The K6's sheath uses a simple locking system to ensure that your knife stays locked in the sheath when not needed. The simple unlocking mechanism can be used easily with the same hand you draw the knife with for single-handed operation. Easy Adjustment - Two quick buckle straps allow for quick adjustment of the K6 on your calf, thigh or forearm. Who is Scubapro K6 Dive Knife for? The Scubapro K6 knife is perfect for divers looking for a traditional large dive knife. It's capable in any situation while not be so long it's difficult to manoeuvre. 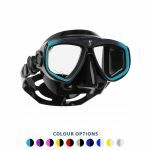 The corrosion resistant 15.5cm stainless steel blade the K6 will resist the challenges of underwater use for years to come. Whether you're a recreational or professional diver the Scubapro K6 is ready to meet your needs with its wide range of features and high quality construction.